When I saw the first image of Nails Inc's new bottles I was very excited by their sleek new design. Round bottles are fine but I personally prefer square, or in this case rectangular bottles as I think they just look nicer. They are also much easier to store as they sit together nicely. Although I love the new bottles I'm not so keen on the new price. Nails Inc varnishes have always been on the higher end of the price scale at £11, but the new editions in the new bottles now range between £14 and £16. Earlier this year I was one of the winners of a nail art competition run by the frozen yoghurt brand YooMoo and one of my prizes was a Nails Inc manicure gift voucher. I didn't really want a manicure, if possible I wanted to use the voucher to buy one of the new Alexa varnishes. To cut a long story short you can use their manicure vouchers to buy products, but they're not accepted in concessions, and as far as I can see all Nails Inc retailers across the UK are concessions, with maybe a stand alone store in London? 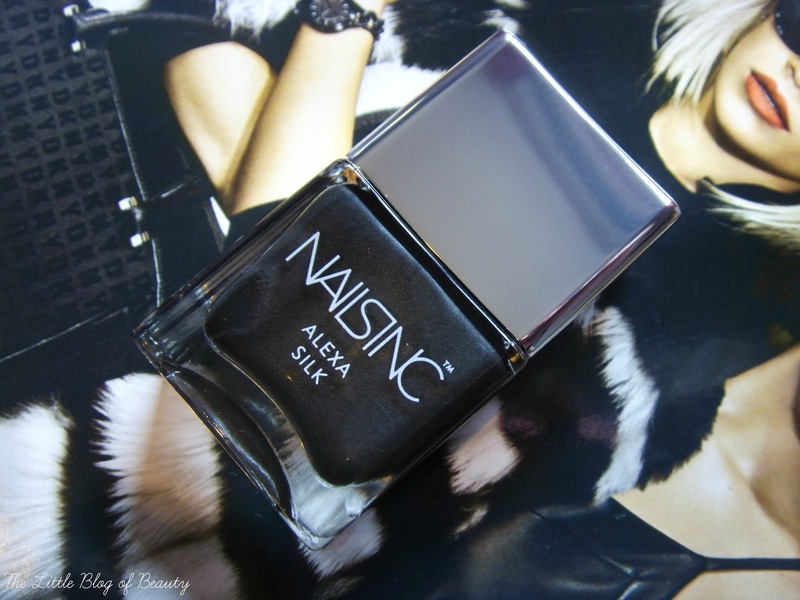 In the end I sent the voucher to them and they sent me the Alexa silk nail varnish. The new bottles are indeed lovely. It has a weighty feel to it and it does look expensive. It's also a good size containing 14ml. You don't have to worry about trying to hold the chunky lid to apply this as the silver lid pulls off to reveal a much smaller round lid. It has a wide brush that covers a good portion of the nail in one brush stroke and the formula is lovely to use. You can easily get away with just one coat as long as you have enough varnish on the brush, if you don't have quite enough it can get a little thin on the third brush stroke along the edge of the nail. I found this dried quickly on it's own but then I always apply a quick drying top coat over the top of my nail varnish anyway. The silk effect comes from this containing a very fine silver shimmer which stops the colour being flat. It's like a black version of Barry M's Silk nail varnishes, which I'm a big fan of. Regarding how long this lasts, I've used this a few times recently on its own and for nail art and I've had mixed experiences with it. When I used it with a base coat from another brand I found that this didn't last very long at all. Within a few hours I'd started to get tip wear and some chips were appearing. Even though nail varnish doesn't usually last very long on my nails this was very disappointing for a varnish that costs £15. However, when I used this with a Nails Inc base coat and also went over the tips with my top coat this lasted a lot longer, I managed to get to a couple of days without any chips (which is very good for me). So I would say this is a very good nail varnish if you use it with other Nails Inc products. I haven't included a swatch here but I did use this for my recent black and gold nail art so you can take a look at this on my nails here. On these pictures you can see the tip wear and chipping after less than 24 hours. Have you tried any of the new Nails Inc range?